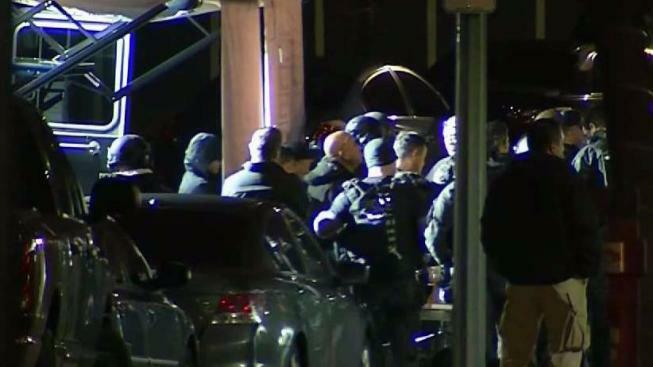 A roughly 34-hour long standoff between officers and a man hunkered down inside a South San Jose hotel room finally came to an end early Tuesday, according to police. The suspect, identified as San Jose resident Edward Ruiz III, 35, was taken into custody without incident around 12:30 a.m., and he is slated to be booked into the Santa Clara County Jail, police said. He was wanted on felony warrants in connection with an armed residential burglary in Milpitas on Jan. 13. The standoff, which began Sunday afternoon, occurred at the Wyndham Garden San Jose Silicon Valley Hotel located along Silicon Valley Boulevard near Highway 101, according to Capt. Jason Dwyer with the San Jose Police Department. Around 2:25 p.m. Sunday, officers first located the man inside the hotel and were able to "isolate him in a room," Dwyer said. SWAT teams arrived around 6:30 p.m., and negotiations continued for several hours. Officers and other first responders on Monday continued to work at the scene of a lengthy standoff with a man hunkered down inside a hotel room in South San Jose. Ian Cull reports. Police evacuated the second floor, as well as sections above and below the suspect's room as a precaution. It was not clear if anyone else was in the hotel room with the man. Dwyer admitted Monday morning that significant progress with negotiations had not been made, but he said the man was not making any threats or demands. An entire block of Silicon Valley Boulevard was filled with law enforcement vehicles late Monday night as officers continued to talk with the man.